‘White Bird in a Blizzard’ is another solid vehicle for Shailene Woodley to show her undoubted talents, with the film initially positioning itself as a coming of age drama set against a backdrop of family problems. The film begins by establishing Kat Connors (Woodley), a 17 year old girl growing up in the 1980s in the kind of suburban neighbourhood we’ve seen many times before in films. Moving between the past and the present, we learn about her disillusioned, alcoholic mother (Eva Green), her blank slate of a father (Christopher Meloni), and her relationships with her friends and the ‘boy next door’ Phil (Shiloh Fernandez). In the early going, we learn that her mother disappeared mysteriously and this appears to serve as the backdrop to a story of sexual awakening as Kat enters into trysts with Phil and the 40 year old detective (Thomas Jane) who led the case into her mother’s disappearance. The film is enjoyable in a meandering kind of way, with Woodley’s raw performance driving a fairly uneventful coming of age story forward. There’s a sense throughout that something lurks beneath the surface in pleasant suburbia, with the flashbacks in particular establishing deeper meaning to Kat’s mother than the present timeline affords her character, but the film takes its time deciding whether it wants to go there. Eva Green’s unhinged performances are often the highlight of a film or a TV show (in recent times, her starring role in the TV series ‘Penny Dreadful’, and films ‘300: Rise of an Empire’ and ‘Sin City: A Dame to Kill For’), but something feels off here. Green never quite masters the American accent and the role would have benefited from a more nuanced performance than what Green is traditionally capable off. Better served is Christopher Meloni (an underrated actor with many strong TV credits to his name) as Kat’s dad, who conveys a kind of suburban boredom well (much like Kevin Spacey in ‘American Beauty’). The film makes good use of its 1980s setting with a great soundtrack and some nice production values that nod at the suburban lifestyle of the period, but it takes its time to return to the disappearance of Kat’s mother to put some momentum into the narrative. The return to that plot point creates some interesting scenarios and leads to an uncomfortable and shocking conclusion to the film which perhaps lends the impression the film was better than it was. 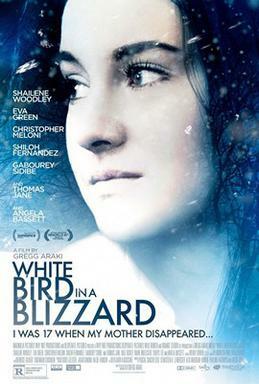 Overall, ‘White Bird in a Blizzard’ is a solid coming of age drama with an excellent Shailene Woodley performance, but it never fully convinces or resonates as strongly as it would like too.